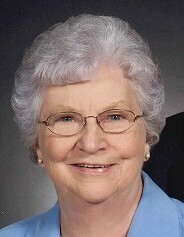 Lois M. Riffle, 86, of Thurmont, Maryland, passed from this life into her eternal home on Friday, March 29, 2019 at Glade Valley Nursing & Rehab in Walkersville, MD. She was the beloved wife of Joseph C. Riffle for 68 years. Born on May 11, 1932, in Catoctin Furnace, she was the daughter of the late Clyde Norman and Harriet Ruth (Spalding) Stitely. Lois was a wonderful seamstress, homemaker, loving caregiver, wife, mother, grandmother and great-grandmother. She was a lifetime member of Thurmont United Methodist Church, where she was actively involved in numerous activities, served in many capacities and will be remembered by many lifelong friends at the church. Lois enjoyed spending time with her family, music, coloring, and was also an avid reader. In addition to her husband, Joseph, she is survived by her children Wanda Campbell and husband Steve of Marblehead, OH; David Riffle and wife Betty of Thurmont, MD and Lori Cobb and husband Danny of Hagerstown, MD. Grandchildren, Cory Campbell and wife Shelley; Kevin Riffle and wife Megan; Emily Cobb and five great-grandchildren. She is also survived by three sisters, Beatrice Bentz; Catherine Atkins and RuthAnn Miller; sisters-in-law Irene Stitely and Minna Stitely; brother-in-law William Riffle and numerous nieces and nephews. She was preceded in death by her five siblings. The family will receive friends from 1:30PM-2:30PM on Sunday, April 7, 2019 at Thurmont United Methodist Church, 13880 Long Rd., Thurmont, MD where a celebration of Lois's life journey will take place at 2:30PM. Pastors Bob Hunter and Steve Campbell will officiate. Memorial donations may be made to either Thurmont United Methodist Church, 13880 Long Rd., Thurmont, MD 21788 or the Thurmont Community Ambulance Service, 27 N. Church St., Thurmont, MD 21788.